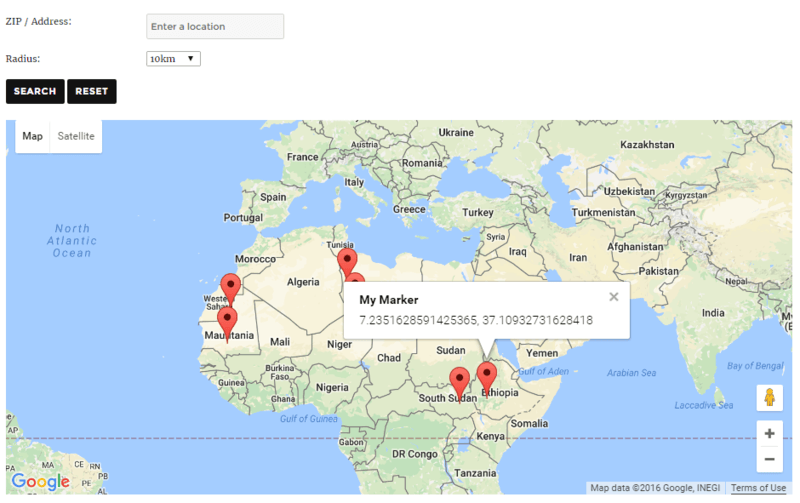 This article covers using the Store Locator feature with WP Google Maps. This article is current as of WP Google Maps version 6. A Store Locator will show a map of your locations and let your visitors find the store, business or marker nearest to them, by entering in their address, and selecting a radius/ distance from them. To enable the Store Locator on your Map, go to WordPress Dashboard → Maps . Click on the Edit link under the name of your Map. Then click on the Store Locator tab. Enable Store Locator: Set this to Yes by clicking the button if it says “No”. Restrict to Country: If you want to restrict customer searches to a specific country, select it from the drop-down list. Show distance in: You can toggle between Miles and Kilometers by clicking the button. Store Locator Placement: You can toggle between Above Map and Below Map by clicking the button. Allow Category Selection: Setting this to Yes allows Customers to search for markers in a specific marker category. Allow users to use their location as a starting point: Please ensure that Show user’s location is enabled in the Advanced Settings tab of the Maps Edit interface. Note: Google Chrome only supports this functionality if your website has an SSL certificate installed. Show center point as an icon: If set to Yes, this adds a marker to the map using the user’s location. Note: Please ensure that Show user’s location is enabled in the Advanced Settings tab of the Maps Edit interface. Note: Google Chrome only supports this functionality if your website has an SSL certificate installed. If this is set to Yes, you can choose your Default Icon. Click the Upload Icon button to upload or choose an icon from the Media Library. Clicking the Reset button will reset the Default Icon to the plugin default. Marker Animation: Choose your desired Marker Animation from the drop-down list. Hide all markers until a search is done: Setting this to Yes will hide all icons on the Map until a Store Locator search is completed. Query String: This is the label for the Address search field. The default is Zip/Address. Default Address: Enter a Default Address here if desired. Enable title search: Enabling this feature allows the Customer to search on the Title of the marker as well as the Address. Title search String: This is the label for the Title search field, if enabled. The default is Title/Description. Line Color: Line color of the radius circle added to the map. This must be a hexadecimal color value. The default is #FF0000. Line Opacity: The opacity of the radius line added to the map. This must be a decimal value between .01 (1% opacity) and 1 (100% opacity). The default is 0.25 (25% opacity). Fill Color: Fill color of the radius circle added to the map. This must be a hexadecimal color value. The default is #FF0000. Fill Opacity: The opacity of the filled radius circle added to the map. This must be a decimal value between .01 (1% opacity) and 1 (100% opacity). The default is 0.15 (15% opacity). This article covered using the Store Locator feature with WP Google Map. If you need further assistance, feel free to contact us.